My thoughts on the books that I read. Bookworm, World Traveler, Musician, Canoeist, Minister, Physiotherapist, Aunt, Sister, Daughter, and Friend. I loved this book! It had an original plot, it made me laugh out loud, and it was paced so that I couldn't put it down. The story takes place in Otter Lake, a fictional reserve located (to the best of my reckoning) several hundred kilometers north of Toronto. 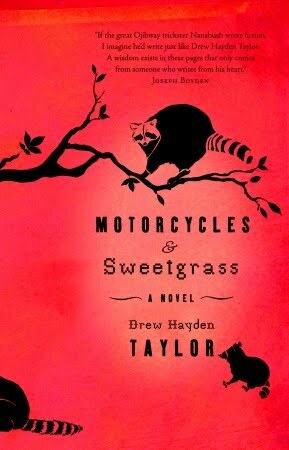 Things get shaken up when Nanabush, the trickster in Ojibwe mythology, rides into town on a 1953 Indian Chief Motorcycle, disguised as a tall, muscular, White man with long blonde hair and eyes that change from blue to green to hazel to amber, depending on his mood (it is implied that this disguise was based on a Harlequin cover!). He has come to say goodbye to his former love, Lillian who is dying; and then stays around to seduce Maggie, Lillian's daughter and the chief of Otter Lake, and to create mischief in and bring magic to the community. Maggie's son Virgil doesn't trust this stranger, and enlists the help of Wayne, Maggie's recluse brother who lives on an island developing an aboriginal martial art, to fight off the stranger. Now how's that for a plot summary?! It reads at times as a fairy tale, at times as a morality tale, and at times as a straight novel. I was reminded at times of Alice in Wonderland / Through the Looking Glass with the absurdity and delight of pure nonsense. In the past couple of years, I have read several great books by Canadian First Nations authors (Kiss of the Fur Queen - Thomson Highway; Through Black Spruce - Joseph Boyden; Three Day Road - Joseph Boyden). This one was much lighter in tone than the others, but still touched on some of the same heavier issues - the residential school experience and legacy, abuse, current day conflict and land issues, education. There is a section discussing the difference between Anishnawbe and First Nations, and I did notice that White is always capitalized (and why not - after all, First Nations / Anishnawbe / Indian is always capitalized). I think that this book will go onto my "to be re-read" list, and it will probably make my "Top Reads of 2010" list at the end of the year. It also counts as a selection for the Canadian Book Challenge over at The Book Mine Set. I had this book as an ARC and didn't get to it. I'm horrible for that. But I'm glad to hear it was good, maybe I'll get around to it quicker. John - definitely get around to it quicker! I've been recommending it to everyone I meet since finishing it last week!